This section concentrates on furniture and decorative objects found in ordinary homes in the fifties and sixties. This subject has been covered many times before. However, the focus has always been on the avant-garde of the period - rather than the kind of things ordinary people had in their homes. This is a selection of the kind of items my parents and aunts and uncles bought for their homes in the fifties and sixties. Furniture from this era was long and low. The coffee table, above, is a good example of this style. It was made from bent plywood, possibly by "Myer", in the sixties. The coffee table was often an item of high style in a suburban home. You could sit down and relax on the sofa with your cup of Nescafe at this table. The shelf underneath is for magazines - maybe "Punch" or the "Sunday Times Colour Supplement". One new piece of furniture, that became popular in the fifties and sixties, was the telephone table. Most telephones were installed in the hall of suburban homes. The telephone table was designed so that you could sit down whilst talking on the telephone. The table, right, has a formica board for the telephone to stand on and a shelf for telephone directories. It dates from the late sixties, or possibly early seventies. This sofa bed, left, dates from 1958. It was manufactured by "Vono" beds. The style is typical of the era - wide and low. The sofa appears to float off the ground on very slim legs. It converts to a singe bed by folding down the arms and putting the two cushions from the back on top of them. Viewed from the side, the arms resemble the fins on a fifties American car. The grey boucl material is also very fifties. The square box look to furniture continued through most of the sixties. However, as well as modern looking designs, manufacturers produced a range of more traditional styles, designed to fit in with homes furnished with real or reproduction antique furniture. Electric lights had first become common in homes in the twenties and 'thirties. Then, the popular style of lamp shade was to have an alabaster or "fruit bowl" pendant, hanging from chains from the centre of the room. Standard lamps were also popular. In the sixties, the lighting became an object of high fashion. The use of new plastics made many new space-age designs possible. British Homes Stores' lighting department was one that lead the way in the sixties. The space-ship style lamp (above right) is made by "Rotaflex Ltd". It is made from a single nylon strand wound round a large number of times. This kind of lamp shade was popular from the late fifties onwards. This space-age lamp (right) is made from spun resin. This kind of lamp was very popular in the sixties. There were smaller versions of this one, table lamps and pendant lamps all made this way. Clocks were another common item that people bought for the living room in the 1960s. This wall clock (left) was made by "Anstey & Wilson". It dates from the late sixties. 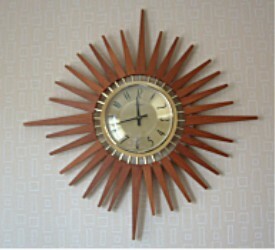 This type of clock, which resembles the sun, with spikes radiating out from the centre, was very popular in the sixties and early seventies. In this example the movement is electric, and not uncommonly for clocks of this period, was made in Japan. Smaller clocks for the mantlepiece were also popular. One company, "Metamic", produced a range of stylish clocks throughout the sixties. This example (right), has an eight-day movement. "Metamic" also made battery and 24-hour clocks as well. This coat rack is of a style known as "cocktail cherry". It was very popular in the 50s following the Festival of Britain in 1951. 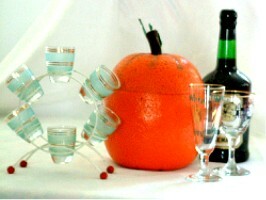 The inspiration came from molecular models used in the world of chemistry. The style remained popular well into the sixties and can be seen on magazine racks as well as coat racks. Turn your home into a lounge bar! The orange (right) is an ice bucket (1950s). There were also apples and, more commonly, pineapples. Port was a favourite tipple of the 50s. The glasses in the circular rack date from the fifties. The feet are in the cocktail cherry style. The "Sparklets" soda syphon (left) was a popular accessory in the 60s. In fact, they were first made in the late 'forties. This example dates from the 'fifties. They are filled with CO2 from a bulb. A series of models were available - the "Streamline" (illustrated), the "Hostmaster" and the "Globemaster". The "Globemaster" took two bulbs. In 1963 they cost 74/- for the "Hostmaster", 103/6d for the "Streamline" and 111/- for the "Globemaster". Sparklets soda syphons have been seen on "Only Fools and Horses" (in Dell's flat) and on "The Good Life" in the local. 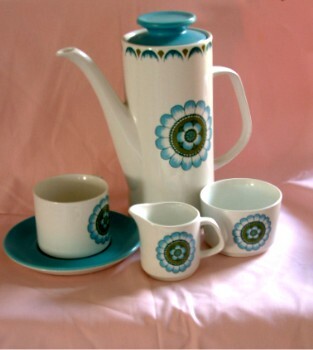 This coffee set (right) was manufactured by J & G Meakin in the 1960s. Meakins produced a range of coffee sets with this basic shape, known as "Studio", and numerous different patterns. The tall shape of the coffee pot is typical of the era - as is the pattern - a flower - the motif for the 'sixties.